Before the Iron Grenadiers existed, Destro’s organizational presence was MARS. The only MARS/pre-IG character figure to gain action figure status was the 1984 Scrap Iron, somewhat erroneously presented as a Cobra figure. With an amazing no-frills dark blue uniform and red padding, the figure didn’t look like an employee of Destro. It even sported a molded Cobra on its helmet. But Cobra or MARS affiliation didn’t really matter, as Scrap Iron simply looked like a bad guy’s bad guy. 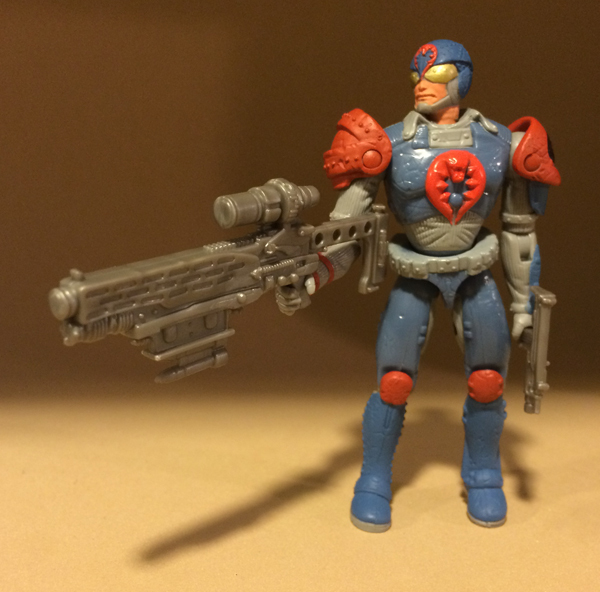 In 2005 Hasbro gave Scrap Iron a New Sculpt era uniform change. Instead of using this opportunity to deck out Scrap Iron in IG red/gold/black, they went another route. A fluffier route. The uniform’s light grey and medium blue color set just looks bland. The dashes of red only push it into weirdness. The uniform itself is a mess. What appears to be a corduroy jumpsuit is buried under layers of curved armor, including independently hinged mega shoulder pads. Shoulder pads so tacky that even make Rob Liefeld would cringe. Three Cobra symbols clutter the design, too. The tampo symbol on one of the shoulder pads looks nice, but the other two are sculpted. Like many of the sculpted New Sculpt Cobra symbols, they look like a bear traps. Obviously, zero Cobra symbols would have been a nice Iron Grenadiers indication. Remember the oversized weapons in The Fifth Element? Apparently someone at Hasbro did too when he/she came up with the ridiculous… thing that Scrap Iron came with. It has too holes in the side, indicating that it may have originally been included with another figure, and perhaps a backpack to which it could attach. Does anyone recognize it? The small machine pistol was a frequent flyer of the new sculpt run and it’s pretty good. This is a new sculpt figure, so the proportions have to be discussed. The head is slightly small and the torso is somewhat short. Otherwise it’s not too bad. If someone saw this figure for just a fraction of a second, the first impression might be that it’s a Transformers figure. If the flesh tone of the face and neck were replaced with silver and gold, it would easily look like a robot that both Optimus Prime and Yukon Cornelius would want to befriend. As one of the few collectors quick to defend the new sculpt era, I’ll give Hasbro credit for stepping out of its comfort zone with a classic character. Hasbro wandered away from Scrap Iron’s utilitarian soldier uniform and went for a fancy overly complicated getup. Sometimes radical new things are just too new and too radical to take root. This Scrap Iron is the Pontiac Aztec of the New Sculpt era. Yeah, this guy is “out there”. The head kinda works as an update, and I guess a floppy shirt collar is a trademark look for Scrap Iron (?). But the overdone armor is heading into sci-fi territory. The sculpted Cobras are pretty bad. Oddly, the only thing I really like is the gun. It’s SO over-the-top that it’s comically cool! I have never seen this figure before. I am an on again off again fan of this era, and I can say that every aspect of this figure is the reason why I am like that for these years of the line. I’d say the original Scrap-Iron figure was erroneously presented as a Destro employee if anything. The figure came first, the bio second. Hama was just filling in a blank slate, with no knowledge of what Destro’s employees would look like or what the future of Destro would be. MARS is only mentioned in passing in early GI JOE comics, we never see anyone who works for Destro until the 60’s issues. In the comics Scrap’s connection to Destro is practically non-existent, with few scenes together. It’s like Hama forgot the character’s backstory. I’ve always felt like the Dreadnoks, and Tollbooth, were meant to have been released in 1984, because of how their heads were designed. And the fact that the Dreadnoks (I don’t remember Tollbooth right now) were featured in The Revenge Of Cobra mini series, tells me that I might be right about that. Anyway, if I had to choose between this Scrap-Iron, and the 2005 comic pack version, I’ll take that one over this one, any day. Even if this one looks a little bit like Robocop. Although, I wonder if that suit would give Scrap-Iron enough super human strenth to be able to fight Robo-Joe in a hand to hand combat. And, did you noticed that they always released more Joe figures, than Cobras, and other bad guys figures, every year? I always hated that. It must have been in response to children like me, because I refused to countenance the thought of my parents purchasing a Cobra figure for me when we were out shopping. I only wanted the good guys, and then only the clean-shaven ones (which, admittedly, somewhat limited my options at the time). I only had any Cobras at all because my grandmother would send my brothers and I random boxes of loose figures from garage sales.